Tribal Criminal Law and Procedure examines complex Indian nations’ tribal justice systems, analyzing tribal statutory law, tribal case law, and the cultural values of Native peoples. Using tribal court opinions and tribal codes, it reveals how tribal governments use a combination of oral and written law to dispense justice and strengthen their nations and people. Carrie E. Garrow and Sarah Deer discuss the histories, structures, and practices of tribal justice systems, comparisons of traditional tribal justice with American law and jurisdictions, elements of criminal law and procedure, and alternative sentencing and traditional sanctions. 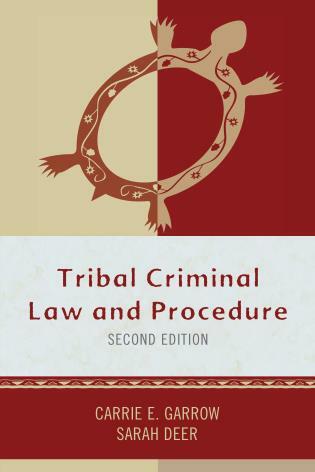 Tribal Criminal Law and Procedure is an invaluable resource for legal scholars and students. The book is published in cooperation with the Tribal Law and Policy Institute (visit them at www.tlpi.org). Carrie E. Garrow is a member of the St. Regis Mohawk Tribe. She is a visiting assistant professor at Syracuse University College of Law and the Chief Appellate Judge for the St. Regis Mohawk Tribal Court. She also is a judicial consultant and currently works for Tribal Law and Policy Institute. Sarah Deer is a citizen of the Muscogee (Creek) Nation of Oklahoma. She is a professor of law at the William Mitchell College of Law. She is a 2014 recipient of the MacArthur Foundation's Genius Grant. 5: Introduction–What Is Criminal Jurisdiction? Carrie Garrow and Sarah Deer’s Tribal Criminal Law and Procedure is an excellent resource for students, practitioners, or anyone else seeking to understand tribal justice systems from a tribal perspective. This book successfully weaves together shared experiences of colonization as well as core criminal justice concepts to provide a broad, yet focused, treatment of the field from its history through its most recent developments. This book is a must-read for tribal, federal and state practitioners, judges, officials, and citizens to understand the framework of tribal criminal law and its roots in traditional norms. From the historical to the contemporary, the authors have skillfully presented a thorough and engaging view of tribal criminal issues. Tribal Criminal Law and Procedure has proven to be an important tool for college and professional students at any level in developing the leaders and thinkers to meet these Indian country goals through the development of tribal law. Moreover, this new edition makes accessible the ongoing changes and developments in tribal, federal, and state law and policy of the last decade. The authors, leaders in the field, are to be commended and thanked for this project.